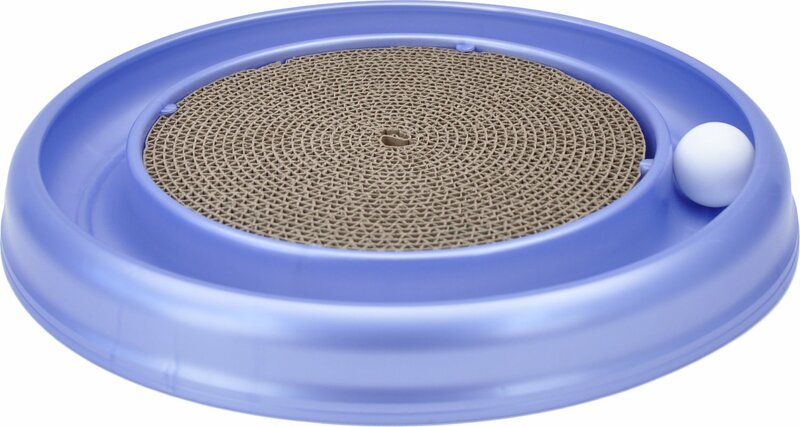 Just like its circular design, there will be no end to the fun your kitty will have with the Bergan Turbo Scratcher Cat Toy. It’s like two toys in one with a tough corrugated cardboard center to stretch and exercise his claws and a fun ball he can bat around the outer track that will offer hours of fun and entertainment to help reduce boredom, anxiety and destructive behavior. The included catnip helps entice your feline friend to play, while the non-skid feet on the bottom help keep the Turbo Scratcher still and stable on smooth, hard surfaces like wood or tile flooring. Two fun toys in one—an engaging cardboard scratcher and an entertaining ball in a track. The durable cardboard scratcher surface lets your feline friend stretch his claws and exercise his toes. The ball spins in the track as he bats it around and around; hours of fun without having to chase the ball around the house. Non-skid feet on the bottom of the toy help keep it still and stable on wood or tile flooring. Catnip included for a burst of energy followed by deep relaxation; fun toy helps prevent boredom and protect your furniture from kitty’s claws. This product recently went through a packaging change. Customers may receive old color. New color is shown in images. To ensure the safety of your pet, supervise your pet at all times during play. Do not allow your pet to play with the toy if any part of the toy comes loose or separated. This toy is intended to be used only with supervision. Click here for Replacement Scratch Pad. Click here for Replacement Ball. Compatible with the Bergan Catnip Cyclone Cat Toy. I bought this for my 3 months old kitten, with hope that she would love it. However, she tried this, and it was too light to stay there for a cat to scratch. She was always pushing it around, and soon lost interest on this. I tried to pull the ball out of the track, and offer her as a "new" toy, however, she was not interested in that too. As a kitten who is a crazy fan of balls, I have to say, this was a poor design. Almost 3 months since I bought this toy, she showed no interest, either did I. Best cat toy/ scratcher ever! Bought this toy for my three furry purry babies. I have two fat boys and one long and slinky girl. All three of them love this toy! They play and scratch every day since I got the thing. Who would have thought the simplest toy is now their favorite?!?! I'm happy because it saves my couch from becoming their favorite scratching place! And you can purchase refills for the cardboard scratcher, yay! My Harley loves this!! He's even playing with it as I write this review. I was unsure whether or not he'd use it but from the moment I took it out of the box, he loved it. I love that the ball will continue to roll until it completely stops. Sometimes it'll make another circle around. I think this is why he loves it so much. Makes him feel like it's a mouse or something. My only issue is that it's noisy when the ball is rolling. Maybe its different on carpet. But really not a big deal. I love that he loves it. Oh we love this day and night! An interesting package arrived and was unwrapped revealing a blue “cage” holding a white ball protecting a scratching pad full of catnip! Yum! We bat that ball around whenever we feel like it, which is quite often ... especially when our people are sleeping! It is THE best! We bat against one another and climb onto the pad at the same time! Our lady keeps taking photos of us-she likes it too! Shhhhh..... it's a gift they haven't received yet! I bought this for my three cats and my youngest (10 months) loved it. Unfortunately, within twenty minutes he managed to get the ball out and knock it under the couch. I put the ball back in, and he immediately got it out again. It would be the perfect toy if the ball would stay in place. My cats love this scratcher so much so that one has taken up residency. She sleeps on it every night, I believe she has claimed this to be hers and hers alone. So I decided to order 2 more for my other cats. My cats are up in age, yet play like kittens with this scratcher toy! Thank you for a lot of laughs! Yes!!!! I was hoping this would distract my cat from tearing up my carpet floors. It totally worked !!! He is longer scratching the carpet he goes right for the cardboard and loves the ball Sometimes I take the ball out and roll it on the floor he goes crazy chasing it !!! As far as I’m conserned for a toy is fantastic I might just get one more ! My cat Georgie loves this toy, but the problem is he can take the ball out, and it takes forever to find. I have ordered 2 replacement balls and they went missing the 1st day I received them, I'm sure they will show up eventually. I wish it was redesigned where the ball was harder to get out, or maybe my Georgie is just extra smart :) I do love the toy. My Diggity really enjoys his new turbo... It's good to see him more active, day and evening!! It's a good sound! I really like how you it can transform into 4 different shapes... Looks like, I'm going to add the track!! It doesn't get any better than that!